Sorry if I've missed this but I have a horizontal dropout (1st gen Cotic Roadrat) and every time I tap the disc brake the non-driveside of the axle slides back and the front of the tire rubs the non-drive chainstay. It even happens if I pedal hard enough too. I need something to trap the axle from sliding backwards under braking. 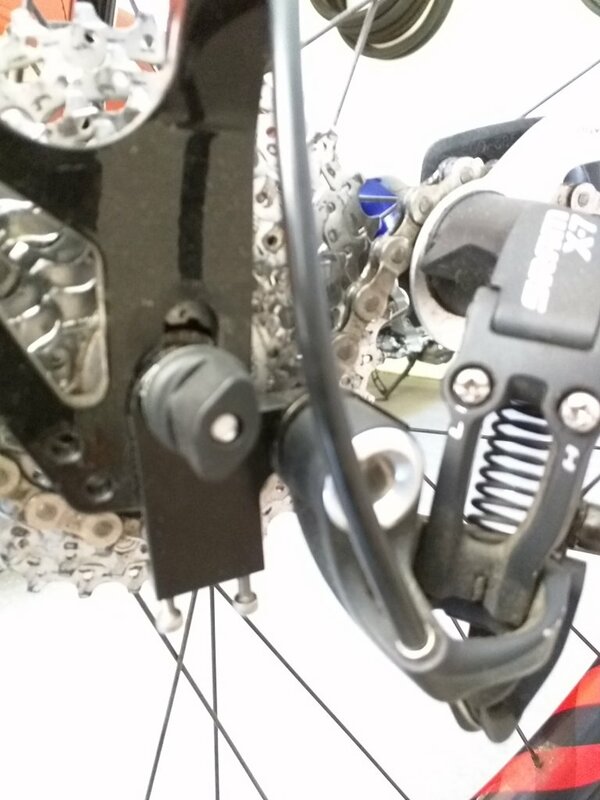 I have my QR so tight it feels like it will snap yet it still moves easily under braking. I've tried to find locking washers. 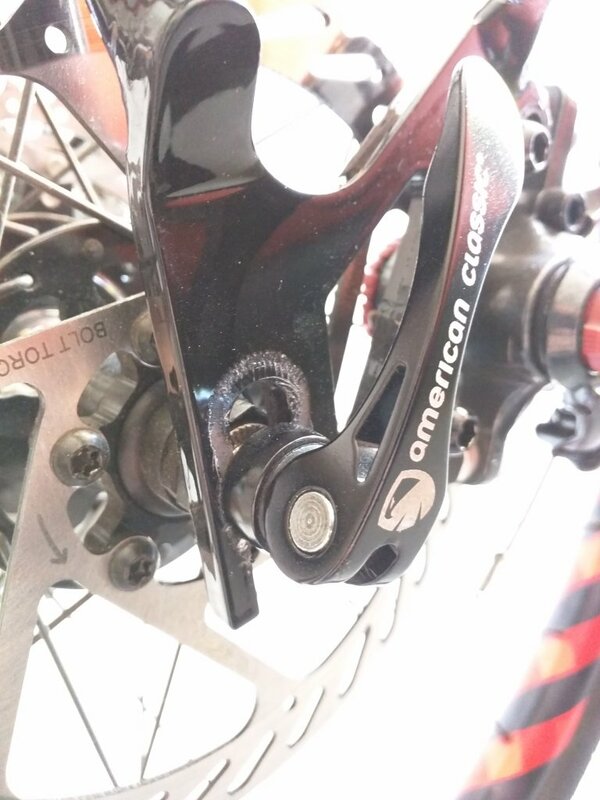 I've looked at dropping $70+ for a 10mm thru-axle conversion of my AC hubs but being there would be no additional clamping area on the dropouts I doubt it would help. Is there any part out there that can trap the axle from the front of a dropout and somehow secure itself to the junction of the seat and chainstays? If I need to take some better pics to help explain just let me know but here is the basic frame . Thanks. With people liking mongoose and trek bikes now, what's next in this crazy world? People disliking the bottlerocket?! bolt-ups are usually best for horizontal dropouts. do you have a high quality QR skewer, like a DT Swiss? Are you sure it's sliding backwards on the non-drive side and not sliding forward on the drive side? Especially if it's happening under harder pedalling. I think a regular chain tug on the drive side would solve it, but going to a bolt up axle would also be a solution. If you want to stick with a quick release then good old fashioned Shimano ones are hard to beat for clamping force. A star washer between the hub and the dropout can help it bite as well but I find that to be a bit of a cludge. Thanks Grumps. I know it's the non-drive side because this bike has a combination chain tug / derailleur hanger on the drive side so it can't move. I can't seem to find a star washer that is both large enough to bite into the frame yet has a small enough hole just for the qr skewer. Large enough washers have large holes too and they just shift around on the skewer. I'd consider the American Classic skewer that came with my wheelset to be of high quality, though I can say both the knurling on the hub end and the skewer side are rather, eh, not aggressive. I also don't know if perhaps this set came with a Ti skewer and I know those stretch more than steel. I dug around my parts bins and couldn't come up with any standard XT skewers, might have to pick up another. I've also eyed up the RWS you mentioned as well. For a steel frame would you recommend the 135mm width over the 145mm? Surly has an adapter piece to fit for the QR skewer with its chain tug. Stick with the width you're currently running, my guess you have a 135*10 rear, so stick with that or go bolts. Could try the RWS, but the chain tug is the best. is your QR binding at all when you tighten it? lubing the point of contact with grease or oil will dramatically increase clamping force if it is not operating smoothly. I've done it with QR's on seatposts and wheels with good results. might help. That Surly part is for the drive side. I already have a tug on that side. What I need is exactly opposite....a piece that holds the DISC side forward INTO the dropout because my disc side keeps slipping backwards out of the dropout. Not binding, it clamps smoothly. I'm using all my force but it's still smooth. Short of finding a reverse tug I need a lot more "bite" from my hub end and QR. I have tugs on both sides of my MUSS and even have a threaded axle with track nuts. Overkill? Perhaps, but that wheel of mine ain't movin. I'm not sure what you are asking for exists, maybe Problem solvers has something to help, idk. One issue that would make it difficult to make would be where the reverse tug would attach and be secured against your frame. I'm thinking you should spend some time at the local hardware store and make what you want if you're handy. I think I read above that you've tried washers, but the hole was too big so the skewer moved around. That's why I suggested the Surly chain tug with the adapter. Some sort of infinity loop bracket with one loop horizontal to the vertical other, like a twisted S hook, but it would be clumsy. I've thought I may need to find a friendly local fab shop to make something simple. The Advantage my frame has is a nice chunk of plate steel at the dropouts to find an anchor point. I'll attach a pic of the hanger and the disc side I have to work with. You'll see I used to run my wheel slammed but that was road wheels with 35c tires and v-brakes. Now I'm disc-only with 29er wheels and 47c so that's no longer an option. Definitely lost some clamping area moving back. You don't need something to pull the axle forward, you just need something to stop it heading back. You need something that sits inside the dropout, with a grub screw that you can adjust similar to the dropout adjuster screws on classic steel road bikes. Of course, you'd need something that you could fix in place to the sides of the dropout, with the "stopper" stepped to fit inside the dropout. I could draw it, but I'm screwed if I can describe it. Is the XT skewer steel? The AC one is aluminum right? The parts that contact the dropouts at least. Update regarding CCDB Air and "progressive" or "forward" rocker mount position.